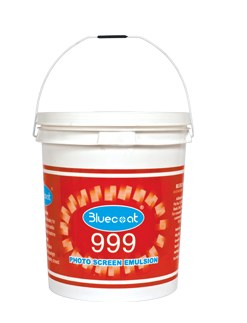 Bluecoat 999 is used for exposing designs in textile printing Under the Direct Emulsion Technique of stencil preparation Bluecoat 999 is coated on the screens and within no time screen is ready for printing. Bluecoat Photo Emulsion is manufactured under standard conditions and strict quality control. Once the screen is exposed, it needs to be hardened with Bluecoat Hardener. 1 kg, 10 kg & 25 kg plastic bucket.